1903: Completed by Liver & Wilding Ltd, Fleetwood for John Liver, ‘Brookfield’, Fairhaven, Lytham (64 shares) as RELIANCE at a cost of £1200. 23.11.1903: Registered at Fleetwood (FD210). John David Gibson, 88 York Terrace, Fleetwood designated ship’s husband. 24.11.1903: Sixteen shares sold to John David Gibson, Fleetwood, designated managing owner. 27.11.1903: Eight shares sold to Walter Whittaker, Hill Top, Cheadle Hulme. 7.12.1903: Eight shares each sold to Agnes Liver, Frank John Liver and Herbert James Liver all of ‘Brookfield’, Fairhaven, Lytham. 9.12.1903: Eight shares sold to Arthur Thomas Liver, 158 Dock St, Fleetwood. 28.5.1904: Re-measured at Liverpool and tonnage altered to 20.10 net. 11.3.1907: Arthur Thomas Liver designated managing owner. 1917(?) : Arthur T. Liver, 4. Clarendon Road, St. Annes-on-the-Sea (managing owner). 1925: Sold to Mary Ellen Leadbetter, Fleetwood and Others. 1925: Sold to Thomas W. Dixon (64.64), Holm Lea, Earls Road, Whitehaven (managing owner). 24.11.1925: Fleetwood registry closed. Registered at Whitehaven (WA25). 1925: Converted to auxiliary motor. 1947: Sold to Mr & Mrs Davison for conversion to a yacht. 02.06.1949: On passage to Cuba. 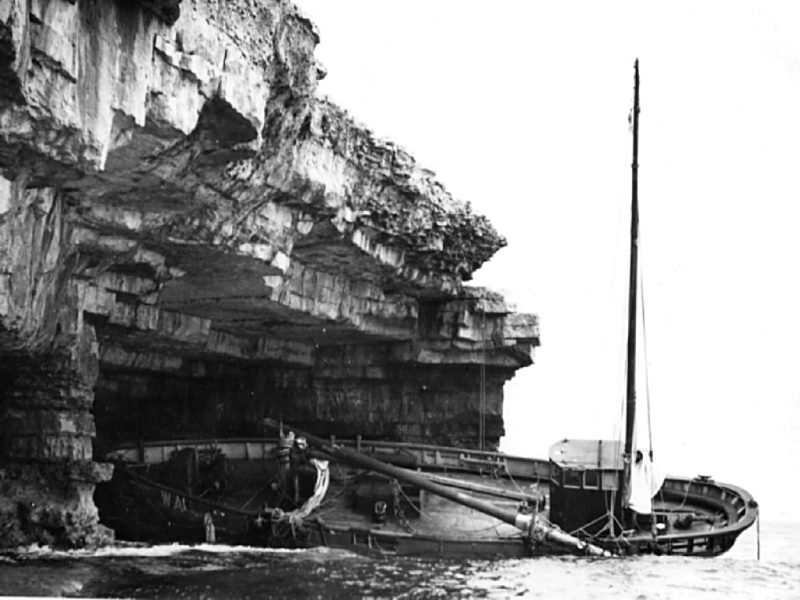 In gale force winds driven ashore at Cave Hole, Portland. Mr Davidson lost his life. 4.6.1949: Mrs M. Davison climbed cliffs and rescued by coastguard. Total loss. 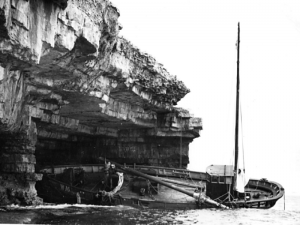 This entry was posted in Lost Vessels, Sailing Trawlers and tagged Arthur Thomas Liver, John David Gibson, Ketch, Liver & Wilding Ltd, Lost, Mary Ellen Leadbetter on February 23, 2009 by Fred Smith.